Description: The Golden Knights are marching on to the Stanley Cup Final! It's a great story, but definitely not a fluke. Paul is tired of all the blowouts in the NBA conference finals. The Cardinals have a rookie throwing 105 mph. Plus, Justify is one win away from the Triple Crown. Description: The Supreme Court has opened the door for gambling on sports. Paul says Cleveland is the favorite, but Boston is the better team. Can the Rockets get past the Warriors when it really counts? Tiger Woods posted a 65 and says he's feeling good. Plus, the Capitals deserve some credit. Description: LeBron James still owns Toronto. Brad Stevens outcoached Brett Brown. The Rockets and Warriors are on a collision course. The Dodgers are struggling and without their ace. Plus, Justify lived up to the hype in the Kentucky Derby. Description: LeBron proved once again that he's the best player in the world. The Pacers came up short, but they put up a great fight all season. Don't expect much drama in the Western Conference semifinals. Paul tells you which teams came out on top at the NFL draft. Plus, who you should take in the Kentucky Derby. Description: Which quarterback is the best in this draft class? Paul tells you what one longtime NFL scout has to say and it will surprise you. The NBA playoffs are heating up in the Eastern Conference with three series tied at two. Plus, some NHL fans lost their minds! Description: After one loss to the Pacers, media bobbleheads are already questioning LeBron James. Paul tells you who to look out for in the Eastern Conference. The Capitals are in trouble in the first round of the playoffs. Find out who's hot and who's not in MLB. Plus, a great Boston Marathon for the red, white, and blue! Description: Patrick Reed held off Rickie Fowler and Jordan Spieth to win the Masters. Reed may not be a fan favorite, but he's a major champion. The NBA season is coming to a close and a lot is still undecided. Is it time to change the Stanley Cup playoffs? Plus, Shohei Ohtani is taking MLB by storm. Description: Paul ranks the top 25 NBA players of all-time. If you love hoops, you don't want to miss this show! This special edition of the "Roberts Rankings" also includes some great players who got snubbed. Find out who is in and who is out! 514: Basketball and Baseball Bonanza! Episode 514: Basketball and Baseball Bonanza! Description: The Final Four is set and the Ramblers are still dancing! Paul tells you if Loyola-Chicago has a shot against Michigan and if anyone can stop Villanova. The 2018 MLB season is upon us. You will get predictions for each division, the NLCS, the ALCS, and the World Series. Description: Most NCAA tournament brackets have been blown up thanks to one upset after another after another. Paul recaps all of the madness and takes a closer look at which teams are still standing. It has been a strange season for the Cavaliers and now Ty Lue is taking a break from coaching. Plus, Tiger Woods continues to play well as the Masters approaches. Description: If you love college basketball, you don't want to miss this show! Paul covers everything from teams that got snubbed to upset specials to his Final Four picks. You will also find out who the oddsmakers think will win the national title. Plus, thoughts on Tiger Woods and Jake Arrieta. 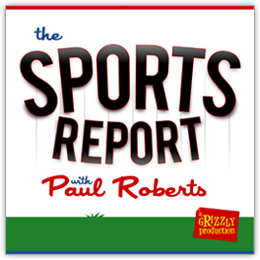 Description: The return of the NFL combine means it's time for another "Roberts Rant." Paul tells you which team will win the NCAA men's basketball championship. Find out what the Rockets need to dethrone the Warriors. Kobe Bryant made an interesting comment after winning an Oscar. Plus, a list of the best sports movies and thoughts on Phil Mickelson's big win. Description: Paul can't understand why people are shocked at the latest college basketball scandal. Unfortunately, this is business as usual. Stan Van Gundy bashed the NCAA while Gregg Popovich defended LeBron James. Ratings for the Winter Olympics took a tumble. Plus, Tiger Woods is making progress. Description: A look back at NBA All-Star weekend and a look ahead to the second half of the season with analysis of the top teams in each conference. Paul explains why he's not watching a lot of the Winter Olympics. Will Tim Tebow be in the major leagues? An awful story from the NHL. Plus, big wins for Austin Dillon and Bubba Watson! Description: Here's a sports list that is sure to spark a debate. Paul ranks the top 15 QB's of all-time. Find out who is #1 and who got left off of the list. You may be in for some big surprises! Description: The Eagles won their first Super Bowl in thrilling fashion over the Patriots. You won't find a more comprehensive recap of this instant classic anywhere! Paul looks back at all of the offensive fireworks and one gigantic defensive play by Philadelphia. Once again, the Super Bowl lived up to the hype. Description: A backup quarterback has led the Eagles to the Super Bowl. Nick Foles and company will be underdogs once again when they square off with the Patriots. Tom Brady worked his fourth-quarter magic to stun the Jaguars. Paul looks back at every key play in both the AFC and NFC Championship Games. Plus, one of the Eagles called out the wrong guy. Description: A 61-yard touchdown pass on the final play kept the Vikings' season alive! Paul takes a close look at all four divisional playoff games. The Steelers and Falcons made some questionable decisions. Mike Mularkey is done with the Titans and Kevin Sumlin has a new job. Plus, a legendary sports broadcaster died.